Above: A 1930s publicity picture of Jean Rogers. Jean Rogers is one of the best-known heroines of the sound serial era, thanks to her appearance as Dale Arden in the first two Flash Gordon serials. But, even had she not co-starred in these two immensely popular cliffhangers, her good looks and her warm screen presence would have assured her a prominent place among serial leading ladies. It wasn’t only her stunning blonde beauty that endeared her to serial fans; she was also one of the best actresses to star in a serial. She possessed a lovely, intelligent-sounding voice which she could make formulaic dialogue seem fresh and realistic, while her expressive face could register convincing reactions to very improbable turns of events. Her work in the Gordon serials is easily her best-remembered, but she also played memorable heroines in four other 1930s serials. Born Eleanor Dorothy Lovegren to Swedish immigrants in Belmont, Massachusetts, Jean Rogers’ earliest interests were artistic, not theatrical. Her plans to study illustration and painting after finishing high school were stalled when she entered and won a Massachusetts beauty contest sponsored by Paramount Pictures. Such contests, though advertised by Paramount and other studios as searches for new stars, were usually mere publicity gimmicks, but in Jean’s case the contest led to stardom of a sort. Independent producer Charles Rogers, at this time affiliated with Paramount, noticed her and brought her to Hollywood. She began her career there in 1934 with a bit in Rogers’ drama Eight Girls in a Boat; she then played bit parts in Warner Brothers, Fox, and Universal films like Footlight Parade, Stand Up and Cheer, and Manhattan Moon. Around 1935, her mentor Charles Rogers was poised to assume the position of production chief at Universal, and he recommended that she sign a contract with the studio. After signing with Universal, Jean was given her first prominent role as the female lead in the horse movie Stormy (1935), but the studio then decided to showcase her in serials instead of starring her in features. The first of her cliffhangers was Tailspin Tommy in the Great Air Mystery (Universal, 1935). Great Air Mystery, a sequel to Universal’s earlier Tailspin Tommy (1934), was based on Hal Forrest’s comic strip. Clark Williams starred as “Tailspin” Tommy Tompkins, a young pilot, while Jean Rogers was his girl Betty Lou Barnes. Along with their pal Skeeter Milligan, Tommy and Betty joined Betty’s oil tycoon uncle (Bryant Washburn) on a trip to the island South American country of Nazil, where a rebellion backed by an unscrupulous rival oilman (Matthew Betz) was taking place. The young American flyers helped the rightful ruler of the island, Don Alvarado (Harry Worth), defend himself against the rebels and their aerial bombing fleet. A likable barnstorming adventure with a colorful setting, Air Mystery was made additionally enjoyable by its cast–particularly its young stars, whose good-natured interplay was a pleasure to watch. Jean handled her share of the script with assured charm, showing herself to be already quite comfortable with leading roles. 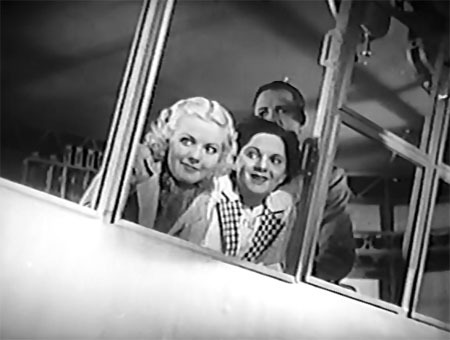 Above: Jean Rogers and Delphine Drew have spotted Tommy and Skeeter’s plane from a dirigible window in Tailspin Tommy in the Great Air Mystery (Universal, 1935). Bryant Washburn is behind the girls. Jean’s second serial, The Adventures of Frank Merriwell (Universal, 1935) was released only two months after Tailspin Tommy in the Great Air Mystery. Merriwell, based on the dime novels by Burt Standish, featured Don Briggs as the Fardale College athlete and all-around hero Frank Merriwell. Jean was Elsie Belwood, Frank’s sweetheart, who accompanied him and a group of their college friends on a perilous search for a lost Spanish treasure and Frank’s missing father; the boys and girls of Fardale were opposed every step of the way by Merriwell’s villainous distant relation Daggett (Bentley Hewlett). Frank Merriwell was an enjoyable but somewhat offbeat serial, in that its script gave as much prominence to Frank’s college sporting events and his other athletic feats as it did to the treasure hunt. The serial’s occasional cliches (such as Frank arriving at the last minute to score a game-winning run for the Fardale baseball team) were put across with conviction by the leads, particularly Briggs, John King (as Merriwell’s best friend) and Jean–who, unlike her co-stars, actually was college-aged and thus able to add a bit of additional believability to her part. Above: Jean Rogers eagerly volunteers herself and her car to stop an impending train wreck in The Adventures of Frank Merriwell (Universal, 1935). Above: Walter Law, Wallace Reed Jr., Herschell Mayall, Philo McCullough, Sumner Getchell (standing left to right) and Jean Rogers, Don Briggs and John King (kneeling left to right) have discovered a treasure in The Adventures of Frank Merriwell. Jean’s next chapterplay, the first of two 1936 outings, was Flash Gordon, definitely the most famous of her serials and probably the most famous sound serial ever made. Based on the futuristic comic strip drawn by Alex Raymond, the serial followed the outer-space adventures of earthman Flash Gordon (Buster Crabbe), his girlfriend Dale Arden (Jean), and Dr. Zarkov (Frank Shannon) as they attempted to stop Ming, ruler of the planet Mongo (Charles Middleton) from subjugating the Earth. Flash was forced to repeatedly battle Ming’s minions and monsters, while Dale was pursued by the slimy Ming, who was determined to make her his unwilling bride. Flash Gordon was a wonderfully successful combination of old-fashioned melodrama with wild fantasy settings, acted with vigor by an enthusiastic cast. Jean’s wholesome good looks suited her perfectly for the role of the virtuous but persecuted heroine, and she maintained an endearingly innocent and natural manner even in the midst of bizarre characters and settings. 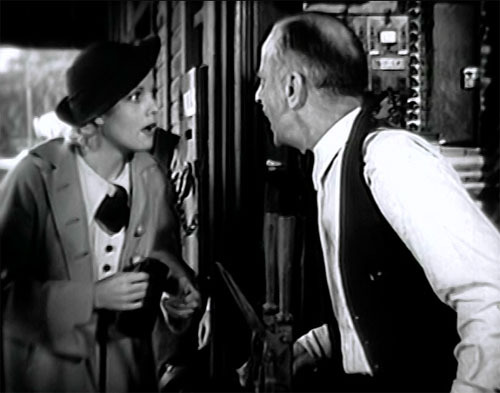 Above: Jean Rogers is threatened by Charles Middleton (right) in Flash Gordon(Universal, 1936). Above: Jean Rogers and Buster Crabbe in Flash Gordon. Jean’s second 1936 serial was Ace Drummond, based, like Flash Gordon, on a comic strip. The villain of the piece was the mysterious Dragon, who was trying to find a mountain of jade in the remote hills of Mongolia. As part of his plan, he kidnapped archeologist Professor Trainor (C. Montague Shaw), the discoverer of the mountain, and also tried to keep International Airways Inc. from establishing an air route in the area and possibly locating the mountain. Trainor’s disappearance brought his daughter Peggy (Rogers) to Mongolia to search for him. Peggy quickly joined forces with Ace Drummond (John King), an International Airways agent commissioned to stop the Dragon, and together they unmasked the master criminal, who had been posing as an apparently respectable personage. Ace Drummond was a first-rate adventure serial, with fast pacing and interesting locations, a strong hero in the person of John King and a charming heroine in the person of Jean, whose fervently expressed concern for her missing father made the quest to stop the Dragon seem that much more urgent. Above: Jean Rogers and Jean Rogers in a publicity still for Ace Drummond (Universal, 1936). 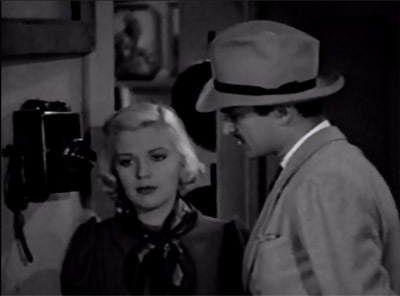 Above: Chester Gan is released by Jean Rogers after being rescued from a death trap by John King (wearing a monk disguise) in Ace Drummond. Guy Bates Post is on the far left, Arthur Loft is between Rogers and King. 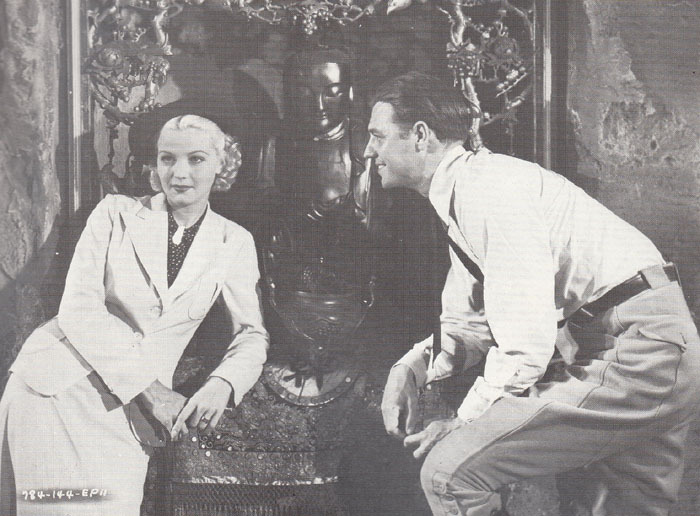 After finishing Ace Drummond, Rogers, not wanting to spend her entire career in serials, began to press Universal for more feature film assignments. The studio obliged by co-starring her in several 1937 films, including the boxing drama Conflict (opposite a young John Wayne) and the Boris Karloff vehicle Night Key. However, 1937 also found her in a fifth Universal serial, Secret Agent X-9. Another comics-based adventure, X-9 was an exciting cops-and-robbers saga that pitted Federal Agent X-9 (Scott Kolk) against the mysterious international criminal Victor Brenda. Brenda engineered the successful theft of the Belgravian Crown Jewels, but subsequently lost possession of them, precipitating a race between his gang and the G-men to locate the jewels. The race was complicated by the activities of Belgravian agents Baron Karsten (Monte Blue) and Shara Graustark (Jean Rogers), who were trying to recover the jewels on their own. This role was the most demanding of Jean’s serial career, since it required her to work against the hero for the first half of the serial while still maintaining audience sympathy. She handled the difficult part well, making Shara completely sympathetic and giving real sincerity to the character’s frequently-expressed regret at not being able to confide in X-9; she also did some excellent acting in her character’s confrontation with Brenda in a later chapter, when she revealed an additional, personal motive for tracking the villain. Above: Jean Rogers and Henry Brandon in Secret Agent X-9 (Universal, 1937). Above: Scott Kolk (left) and Henry Hunter revive a groggy Jean Rogers in Secret Agent X-9 (Universal, 1937). Rogers, realizing that Universal intended to keep her in serials if she remained at the studio,  signed a new contract with Twentieth-Century Fox when her Universal agreement expired in 1938. Her last part before leaving Universal was a reprise of her Dale Arden role in her sixth and final serial, Flash Gordon’s Trip to Mars (1938). In this sequel, Flash, Dale, and Dr. Zarkov traveled to Mars to destroy a “Nitron Lamp” that Ming the Merciless (Charles Middleton again) and Azura, Queen of Mars (Beatrice Roberts) were using to remove important elements from Earth’s atmosphere. Trip to Mars was fully as fantastic and thrilling as Flash Gordon, but Jean’s part in the plot was somewhat smaller this time around; Ming appeared to have abandoned his desire to marry her and thus she wasn’t nearly as central to the villain’s struggle with Flash. She still took part in much of the serial’s action, though, and her chemistry with Buster Crabbe and Frank Shannon (who both reprised their earlier roles) was as strong it had been in Flash Gordon. Above: Jean Rogers, Donald Kerr (as comic reporter Happy Hapgood), Buster Crabbe, and Frank Shannon (seated) try to keep their spaceship from being wrecked by Ming’s Nitron Beam in Flash Gordon’s Trip to Mars (Universal, 1938). Above: Jean Rogers and Donald Kerr explore the Forest Kingdom of the Martian Tree People in Flash Gordon’s Trip to Mars. After moving to Fox, Rogers played noticeable starring and supporting parts in B-films like Heaven With a Barbed Wire Fence (which co-starred Glenn Ford), Yesterday’s Heroes, and Charlie Chan in Panama, as well as A-films like Brigham Young, Frontiersman. She left Fox in 1940 and signed a contract with Metro- Goldwyn-Mayer in 1941; MGM seemed to consider her a promising starlet and showcased her in A-features like Dr. Kildare’s Victory, The War Against Mrs. Hadley, and the Red Skelton comedy Whistling in Brooklyn. However, when she announced her intention of wedding agent Dan Winkler in 1943, MGM executives forbade her to marry, fearing it might hamper her career. To her credit, Jean put marriage ahead of career and left MGM to marry Winkler. Now a freelance actress, she co-starred in a handful of B-films for studios like Republic, Columbia, Monogram, and Pine-Thomas over the next seven years. She made her final screen appearance as leading lady Betsy Drake’s cousin in the psychological thriller The Second Woman (Cardinal Productions, 1950). She then retired to family life, pursuing her old interest in painting and illustration and making a few public appearances at serial fan conventions over the years. Jean Rogers passed away in Sherman Oaks, California in 1991. Jean Rogers brought an ideal blend of ingenuous enthusiasm, spunky resourcefulness, vulnerability, and loveliness to her cliffhanger characterizations; she was, perhaps, the most archetypal sound serial heroine. Her participation in the phenomenally popular Flash Gordon serials would have assured her of serial fans’ notice even had she been an unremarkable actress. But since both her talent and her beauty were quite remarkable, she’s not only noted but beloved by virtually every serial buff. Above: Jean Rogers and Buster Crabbe share a tender moment in the final scene of Flash Gordon (Universal, 1936) as Frank Shannon pilots their rocketship homewards. Acknowledgements: For most of this article’s biographical information on Jean Rogers, I am indebted to Tony LoBue’s page on the actresses to play Dale Arden, which is part of his amazing Flash Gordon website. I have a letter from Jean Rogers dated November,1933 in which she writes to a friend about her acting in Eight Girls in Boat.Is anyone interested in it?